Providing an affordable and reliable light combo, this Urban 900 Commuter Combo from Light and Motion pairs their Urban 900 front light with the Vis Micro II rear light. Delivering 360º of protective illumination, this light set was designed to maximize visibility with its SafePulse Beam technology and innovative amber side lighting. 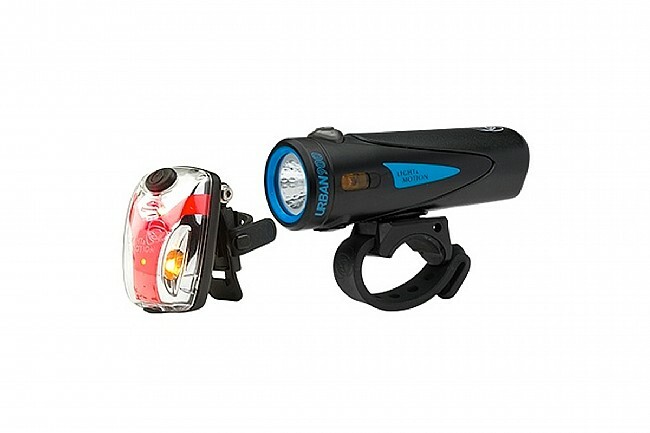 Commuter combo includes the Urban 900 front light (900 lumens) and Vis Micro II (60 lumens). Light set designed to create an effective range of light covering 360º. 4 lightmodes per light, providing up to 20 hours of illumination. Includes: quick release handlebar mount, seat post mount, and Micro-USB charging cable. Pro - great bright light! Best Ive owned - see for miles and miles . Cons - have to make sure charged before leaving house!